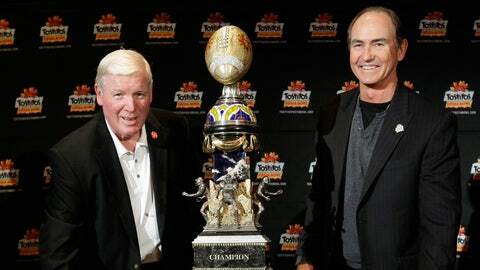 Central Florida head coach George O'Leary, left, and Baylor head coach Art Briles pose with the Fiesta Bowl Trophy Tuesday. GLENDALE, Ariz. (AP) — By now, Central Florida has heard it over and over: It has no shot at beating No. 6 Baylor in the Fiesta Bowl. Viewed as the team none of the other BCS bowls wanted, the 15th-ranked Knights landed in the Fiesta Bowl by earning an automatic berth as American Athletic Conference champions. Awaiting Central Florida on New Year’s Day is the nation’s most explosive offense, a group filled with big, athletic and fast players who churned out more yards than all but one team in FBS history. But no way are the Knights intimidated. They’re in a BCS bowl for the first time and want to prove they belong, that they’re not just some patsy for the Bears to beat up on. 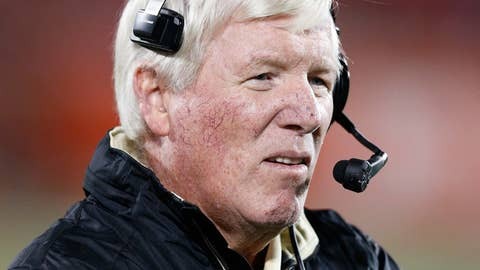 Head coach George O'Leary remains a central figure to UCF's success. "Our motivation is we’re in a BCS bowl game and we’re trying to put UCF on the map," UCF linebacker Terrance Plummer said. "This is our prime-time game, we want everyone to know about us, so as a team we’re not worried about what others have to say about us." What they’re saying is not good. The Fiesta Bowl was viewed as the most lopsided game when the matchups were announced and the perception has not changed. Baylor enters as a 16 1-2-point favorite, highest among the 35 bowls. The reason is that offense. The Bears averaged 624.5 yards per game during the regular season, second-most in FBS history to Houston in 1989 (624.9) and 50 yards more than any other team averaged this season. Baylor also led the nation in scoring (53.3), has one of the nation’s best quarterbacks in Bryce Petty and a star running back in Lache Seastrunk. But for all the Bears have done this season, they’re in the same position as Central Florida, in a BCS bowl game for the first time. And because of that, they are in no way taking this matchup lightly. "We’re never going to feel like we’re the big dog," Baylor coach Art Briles said. "When you start walking around wondering who is looking at you is when you walk into a pole. You better make sure you are taking care of your business or someone is going to sneak up on you and get you." 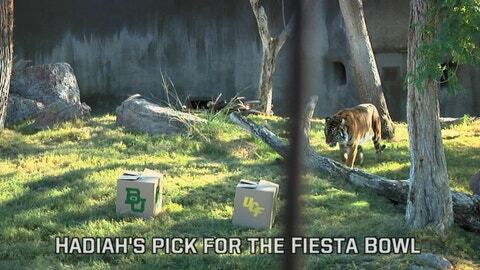 Which team did a zoo tiger pick to win the Fiesta Bowl? One of the reasons Baylor’s offense has been so difficult to stop is its balance. Briles’ system forces defenses to cover not just the 100-yard length of the field, but the 53 from one sideline to the other. Except for Oklahoma State, teams were unable to do that this season, allowing the Bears to finish the regular season fifth nationally with 359 yards passing per game and 12th with 262 yards rushing per game. The speculation heading into the Fiesta Bowl is that it might be the final game for Central Florida QB Blake Bortles, who is reportedly considering a jump to the NFL after his junior year. If it is his final season, he’ll go out on a high note, regardless of what happens in the bowl game. The AAC’s offensive player of the year, Bortles was ninth nationally in pass efficiency at 163.3 and 18th in passing yards per game with 273.3 while completing 68 percent of his passes. With the success he’s had with Baylor, Briles has become a sought-after commodity, rumored to be in the running to replace Mack Brown at Texas or Mike Shanahan at Washington. Briles is a beloved figure in Waco and has said he loves coaching there, but a bigger opportunity could persuade him to leave. One of the best ways to slow Baylor’s offense is by keeping it off the field with long drives going the other way. Running back Storm Johnson will likely be the key to Central Florida being able to do that. The sturdily built junior had a breakout season in 2013, more than doubling his rushing total from a year ago by rushing for 1,105 yards and had 11 touchdowns. He’s also a threat out of the backfield, catching 29 passes for 261 yards and three more scores. Seastrunk has been a big reason Baylor has been able to stay so balanced on offense. The junior from Temple, Texas, had a 1,000-yard season in 2012 and backed it with another this year, running for 1,060 yards with 11 touchdowns. Petty has put up prodigious numbers and is among the nation’s passing leaders, but might not have had as much success without a back like Seastrunk behind him.